I'm a casual record collector. I attended a local record show usually once a year. I go to several local record shops a couple times a month. And basically every time I go out of town I visit a shop or two. I say casual because it is just something I do occasionally with my free time. It isn't my life. Don't Sell at Any Price is about collectors of shellac 78 RPM records, basically the first form of mainstream recorded music. Many 78 collectors are obsessive. As mentioned in the book, comic artist R. Crumb is a famous collector of 78s. Anyhow, the book is really good. 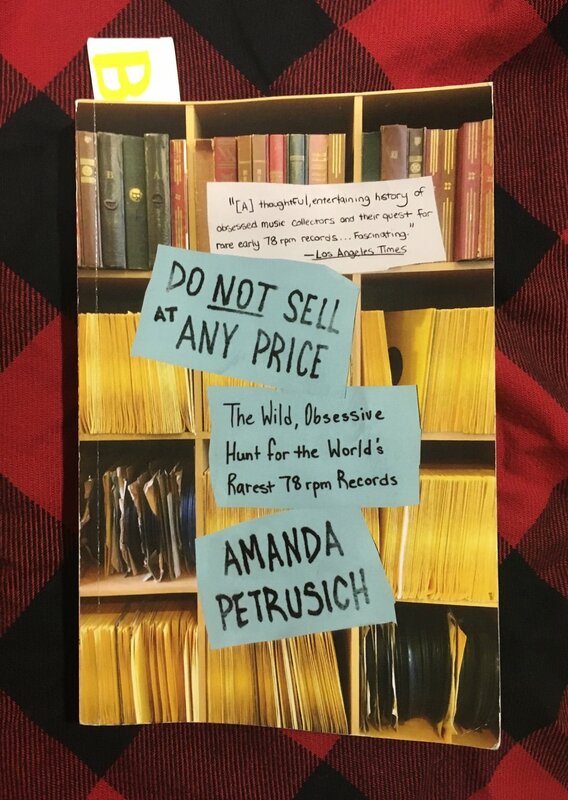 The author, Amanda Petrusich, writes about her meetings and interviews with major collectors of 78s, puts the records they collect and the collectors themselves into their historical contexts and writes about her own search for 78s to build out her own collection. I'm probably the best possible audience for a book like this. I enjoy the music that many of these collectors obsessively search for. I own a number of compilations culled mostly from the collections of the collectors featured in this book. I also own a handful of 78s myself, because they are old and sort of fun to have. Lastly, I might not be an obsessive collector of records but I am a collector of all sorts of stuff and I feel a kinship with people who collect things, especially old things. I found Don't Sell at Any Price to be a really compelling read.